My final caricature assignment is done. Just to be sure nobody asks “so...who is it?”, I slipped in the Daily Show logo. “Stew Beef”, by the way, was/is the Daily Show host’s nickname. Hence the Dinty-Moore-esque beef stew he’s eating. Get it? No? You still don’t see the resemblance?! 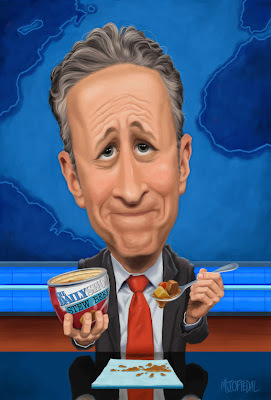 It’s Jon Stewart! By the way, Jason Seiler is a great teacher. Check out his class at Schoolism!